The Maine Regional Library System provides subject-specific consultant services and library liaisons in direct support of libraries. Interlibrary Loan services are provided through three Area Reference and Resource Centers (ARRCs). Along with these services Library Development provides continuing education, information resources, access to state and national initiatives with the goal of making Maine libraries stronger. Maine InfoNet is an organization financiallly supported by the Maine State Library the University of Maine Fogler Library and participating libraries. Maine InfoNet provides leadership and suppprt to Maine libraries by improving information and library service to all Mainers through online systems and technology. Maine Infonet is responsible for the operation of the Minerva, URSUS, MaineCat and MILS integrated library systems, Digital Maine Library databases and the Maine Download Library. If you have questions or problems with any of these systems, please use Maine InfoNet's Ticket System. MSLN - The Maine School and Library Network provides internet access, email, web hosting, and other internet related services to almost 900 schools and libraries across the state of Maine. Contact the support desk with any questions about your internet connection or check out their Frequently Asked Questions (FAQ). These programs are administered by the Maine State Library and funded either in part or fully by the federal Library Services and Technology Act (LSTA) through the Institute of Museum and Library Services (IMLS). State and federal data collection, compilation, and dissemination. Aggregating information from the public library annual reports is an important part of this function. 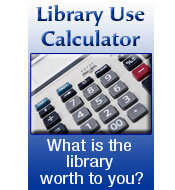 Use the Library Value Use Calculator on your website! Public Library Definition - Working definition of a public library crafted by the Maine Library Commission, February 2012. Some programs under Library Development are administered by the Maine State Library and funded by the federal Library Services and Technology Act (LSTA) through the Institute of Museum and Library Services (IMLS). Information Guide for New Public Library Directors[Word, 27kb] - contains links to important information for new directors. Libraries and Community Links to toolkits and other resources for starting community dialogs- from the Aspen Report to Libraries Transform and more. Librarians - what are you reading - share!